Sir Guy of Gisborne, played by Richard Armitage, is a villain in the BBC television series Robin Hood. At the series' start, Guy, right hand to the Sheriff of Nottingham (portrayed by Keith Allen), tries to gain control over Robin Hood's estate (Locksley) and then takes satisfaction in being named its permanent lord after Robin is outlawed, since he himself has no land to go with his title. 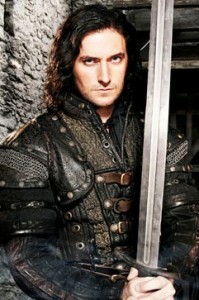 "Gisborne is capable of overwhelming cruelty in his ruthless pursuit for heritage and position". However as the series progress he becomes less robotic and much more human, mostly due to the influence of kind, honorable and generous Maid Marian (portrayed by Lucy Griffiths). In season 2 Sir Guy even tries to arrange her escape from the Sheriff at risk to his own life, and later saves her from execution after he discovers Marian's identity as the Nightwatchman. Their complicated relationship ends in Guy's killing Marian at the season 2 final. In season 3 Guy is overwhelmed with grief and self-loathing. He grows increasingly antagonistic toward the Sheriff, and his confrontation with Prince John (portrayed by Toby Stephens), who is unwilling to make him the new Sheriff of Nottingham, eventually forces him to leave the castle and join Robin Hood. The site exists exists for nonprofit entertainment purposes only. Everything belongs to its respective owners, no copyright infringement intended. I am not affiliated with Tiger Aspect Productions, Richard Armitage or BBC. Deep Shadows fanlisting is a part of sleety.org and TFL. You're looking at the layout version 1.1, best viewed with resolution 1024x768 or higher. Graphics were done by me (deerstop) with Adobe Photoshop CS5 and coding with Espresso, Photoshop brushes courtesy of Hybrid Genesis. Original image taken from www.bbc.co.uk.